Aluminum Switchgear Connectors & Grounding Connectors | Cal Fasteners, Inc.
CMC type SG aluminum switchgear connectors and grounding connectors are manufactured from a high strength specialty alloy that provides maximum strength and conductivity. Type SG connectors are dual rated for use with both aluminum and copper conductors. Electro tin plating improves contact resistance and protects against corrosion for long working life and fewer replacement costs. 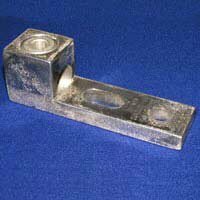 For models sized 350MCM and above, all designs include slotted mounting holes for various mounting arrangements. All CMC products are manufactured in North America and are UL and CSA listed and RoHS compliant. Request a quote for CMC type SG connectors, or contact Cal Fasteners to learn more.